Korvi Rakshand is a Bangladeshi social entrepreneur and the founder of JAAGO Foundation, a volunteer organization established in April 2007. Rakshand was ranked 5th in list of top 10 inspirational Bangladeshis around the world published by British Bangladeshi Power & Inspiration 100 at the British Parliament Commonwealth Room. The JAAGO Foundation is a civil society organization that operates with the help of its employees and volunteer platform, ‘Volunteer for Bangladesh’ for the betterment of people living below the poverty line. JAAGO currently has 14 schools in Bangladesh providing free education to over 1,800 underprivileged children who are supported by 300 employees and 17,000 volunteers. 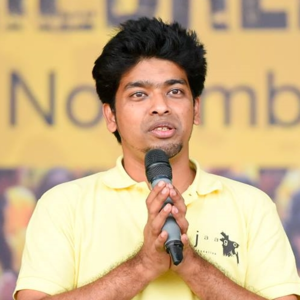 Korvi Rakshand is in Bangladesh and he is the founder of JAAGO Foundation, a civil society organization established in 2007 and based in Bangladesh. JAAGO operates with the help of its employees in volunteer platform with over 10,000 volunteer – that’s amazing. What JAAGO is doing is building and providing free education for underprivileged children there in Bangladesh. So, over 1600 underprivileged kids are learning and understanding the world because of what Korvi has started. He’s been named one of the top 10 most inspirational people in Bangladesh. That was actually named by the British Parliament in Commonwealth. That’s incredible. So, Korvi I am thrilled to have you with us today. Tell us a little more about what you’re doing right now, today and then we’ll jump into our questions about hope. Thank you Chris. Thank you for reaching out to me in Bangladesh. Actually right now, we are are based is in a slum area where we operate and that’s why you hear so much noise. The vote banks are here and there’s huge campaigns going on for the Mayor election that’s happening after 13 years in Bangladesh. JAAGO, it means wake up. We don’t think organization, but rather we think the wake up call for this nation, in Bangla, Hindi, Urdu, it’s the same word. It means wake up. So, it’s a wake up call by the young people, for the young people. More than 50% of the population in Bangladesh is under the age of 25 and they don’t have the space where they can actually go and tell about their dreams and stuff. My journey started when I was 21 years old and I wanted to do something. I went to people and said I wanted to run a school for slum children, especially focusing on English, so that they can communicate with the world. Bangladesh is a labor-oriented country. A lot of people go abroad, but still they’re always being hard workers, they’re always back benchers because they cannot communicate but they’d be doing hard work. So, I thought of teaching English and people were laughing at me saying that they can’t even talk in Bangla properly, how can they talk in English? What I told them was, the reason I am talking in English or I can do something is because of opportunity. I got the opportunity and I learned it. So, I wanted to take that opportunity to the slum children and that is how everything started. The journey started with 17 children on a piece of carpet and today, 1500 is the old number, we have 1800 kids and 17,000 volunteers working for JAAGO Foundation. 1800 kids and 17,000 volunteers? Wow. Where are all these volunteers? Are they in Bangladesh or are they coming from all over the world? The 17,000 that I’m talking about is in Bangladesh. Bangladesh is densely populated. There are a lot of people. That is something we are not short of. It’s not only in Dhaka. I’m sitting right now in Dhaka, in the capital and everything is in Dhaka. If you think about this as the capital city in another city, but their headquarters is in Dhaka. So, you got to understand that everything is centered in Dhaka and that’s why all the opportunities are in Dhaka. My vision was not only to work in Dhaka. I started working in Dhaka because the context, network, money and people are here, but after I showed people, we went out. Two of our schools are in Dhaka and the rest are outside Dhaka and the 17,000 volunteers, 4000 are based in Dhaka and the rest are in the other 32 districts in Bangladesh. Bangladesh is divided into 64 districts, so we have reached half of Bangladesh. Amazing work. I’m listening right behind you. I can hear the…I’m picturing what’s going on outside your window. Are there trucks going by with loudspeakers announcing who the next candidate they want to be? Interesting thing, not only trucks. They’re using all sorts of vehicle. They’re using rickshaws. I don’t know if you know rickshaw? So, there are like hundreds of rickshaws branded and the people sitting. It’s a very joyful thing. One thing is, yes there is some violence going on but it’s like a festival that has taken place if you do it after 13 years and 14 hundreds-thousands of people will be voting for the first time. That’s a good point. So the population you’re educating is really going to be voting for the first time ever? Not our kids. Our kids are still under 18, but our volunteers, a lot of them will be voting this time. Wow, that’s awesome. That’s really awesome. Good for them. Great opportunity. All right. Korvi, here’s how this works, we ask you five questions about hope and you just fire off the answers that come to mind and I’m just really curious to hear what you have to say because you’ve obviously generated an enormous amount of hope for a lot of people. Question 1: What is your definition or your favorite quote about hope? How would you define hope? My definition of hope is – I don’t know if I can explain it to the definition, but my answer will be hope is something that had brought me here today. When I started it, initially I didn’t have any friends who believed in my work. After two years of my work, when I graduated, my parents gave me a condition of whether their business or my madness and if I have to be with my madness, I had to leave home. That’s why I’m based in the slums. I don’t know how long I’ve been living with hope with these children. So, when I say my first line, I always use the word, even in my presentations that I had 17 children on a piece of carpet and a room full of hope. I have been saying this for the last eight years. That is hope for me. People say, what inspires me? Yes, these awards and these recommendations, they’re good, but when I see the child on the first day and I ask him what he wants to become, he says he wants to become rickshaw puller then he wants to become a TuTu driver. Another one said he wants to become a cab driver, a yellow cab driver. That’s the biggest imagination they have. Today if I ask them, they say “I want to become a pilot”, “I want to become an engineer”, “I want to become a barrister” and they’re still young. They believe that like the rickshaw, the plane will be owned by him and he wants to take all his friends who cannot afford the plane. The girl who wants to become a barrister have always seen the mother getting harassed after the father died. She wants to start a pro bono organization like JAAGO helping these women. That is hope for me. Seventeen children and a room full of hope. I love it. Boy, that’s great. You know, it’s so cool seeing hope jumping out of kids’ hearts because kids, they can get hope better than adults can and it’s just awesome. I love seeing that. Question 2: Who has given you the most hope in life? Who has shared the most hope with you growing up? I think as an example, definitely continuously seeing the kids, they are my hope but also the young people who work with me, the 17,000 volunteers, they’re the ones. When I was in trouble starting from when I needed money, they raised money. Together, I wouldn’t say they, we raised money together. I didn’t have money to get teachers, they said I will volunteer. They give me hope, these young people in this country and the amazing work they are doing. When we started, there was no youth organization like that, like the way we were. Now, there are so many young organizations which are not only helping in volunteerism, but also started their startups and small things. That’s hope for me. The young people in Bangladesh, that’s more than 50% of the population, they give me hope. Wow. Good answer, great answer. You’ve got a great support group behind you. Can’t do it alone, can you? Nobody can. Question 3: Tell us more about your story, your background, when was a time in your life when thing weren’t going so great and you know, things fall apart sometimes and we have to really lean on to hope or go to those people who are supporting us or whoever it may have been in your friends or family group. What’s happened in your life where you really needed hope? I think hope is something that you always need. You need that – I won’t say it’s destination, it’s more about travel, it’s more about the journey and in the journey you have to have hope. Yes, definitely there were situations where I was depressed, I was frustrated and these guys came and gave hope. For example, when I started this foundation, I was young and it was more like a hobby for me. I started and after three months, when we were having our promotion, I said let’s make it into a school – I was only teaching them English and where do I get money? I didn’t have money, so I went to some people, to a brother and said can you give me some money to buy some books and stationaries? That’s a small hope. That’s how everything started. Not always, everything has to be big. JAAGO started with 17 children. I had a little piece of carpet. Doing this for a while and at one point I was teaching English. Bangladesh is the only country in the entire world who fought for their language and senior citizens started criticizing me that I was promoting English and started calling me a traitor because I wasn’t promoting Bangla. Bangla is my mother language, that’s in my heart. I’m teaching that to the kids, but English is something that will help them. It’s a language, it’s a communication tool. That time I was frustrated. I went to my friends and they gave me hope to try. If you fail, let it fail. Remember that you are one step into your hope, into your dream. I think those are the situations. When my parents didn’t understand what I was doing and they gave me a condition and I was kicked out from the home and I stayed in the slums, it was something that – I didn’t grow up like that. I came from a well-off family so it was hard. I also didn’t have money to eat because I was so angry that I just left home. The kids, when they heard, when their parents heard that I left home for them, they were the ones who fed me for one month. That gave me hope. I think those are the situations that helped me. These were the people that were behind me. I would say with me, not even behind, they were with me and these are the hopes of my life. Now, my hopes are definitely as I say, the kids are always there, but also the young people in this country. Wow. So, you actually left a well-to-do family and moved to the slums to really be part of the community you were hoping to help and they actually ended up helping you in the process? My background is I’m a lawyer by profession from University of London. My parents invested a lot of money, so definitely they expected me to go and get a good job and a beautiful wife and some children – which I do have, 1800 kids that I’m supporting. So, I think it was a struggle and a bit frustrating at times and this was not the course of my life, but there are times that things happen that changed the course of my life. In the course, I did help them, but I learned so many tips. Yes, it sounds like they’ve helped you as much or more than you’ve helped them. It’s essentially how when we give we always get back more than we give. Question 4: How are you sharing hope today? So, you’ve told us about your foundation work and the things you’re doing in such a huge scale there in Bangladesh. But, when you’re out just walking around town, when you’re talking to your neighbors, when you’re just working on a project with a co-worker, how do you share hope on a daily basis? Honestly speaking, I work 18 hours a day and that’s because I think I don’t work. That’s my hobby, that’s my passion, so I can’t find the difference between I am resting and not working even when probably when I’m just lying down, I’m thinking about the project, how I can develop, where I can get these young people. My free times are all with my volunteers just motivating them. On a Friday or a Saturday, the volunteers will come over and they spend time. They want to learn so many things, they want to ask things, so I think by process the work that I’m doing is actually giving hope. In terms of kids, you can understand that giving them a brighter future, giving them education, but something that I faced because of my age, I was 21 years old, everyone criticized that this is not the time for you to think about charity work. Honestly speaking, there are famous quotes in the world, but I made my own quote to motivate myself. For me, it’s not charity work. Charity, you can do once, twice, thrice and then we’ll see it. For example, okay I’ll get to heaven and yes I’ve done my charity work. That’s not how it should be. It should be like, it’s your responsibility. You have to help these people. So, getting these young people, if you ask me how, I decentralize the power that I had in the head of the organization to motivate these young people means sitting in the capital. I cannot decide what should be in all of the remotest parts of Bangladesh. What we did was an election process that the volunteers take and they get elected. They decide what they should do. Our work is to train them, tell them how to design the program, how to work unitedly, how to raise funds. These are our work, but we let them do the work. Sometimes, they do mistakes and that is the process that you need to teach them. They do mistakes, they’re young people – you need to adore them, you need to scold them together and that’s how we are spreading hope. Me, as an individual, I am training others and others are training others and it’s spreading. That’s why I say I live with 17,000 volunteers. That’s a great principle. So, you’re sharing hope on a daily basis personally with the people around you and you’re teaching them how to do more sharing of hope. That’s critical because I think a lot of times, at least for me I think I need to grow in hope or I need to share some hope, so I’m going to go to one person and do something nice for them. But, what you’re doing is you’re creating a multiplying effect. So, when you teach one person to do what you’re doing, they are empowered now and they go and share with 10 more people who learn and then they share with 10 more people, so we now got a more than a hundred people then we get a thousand people then…yes, I love it. You’re making an enormous impact by teaching people how to do this, not just doing it yourself. The whole idea that me as individual, maybe everyday I’ll give one hour to help a person after my work, but if my work is to inspire others to help others, it automatically keeps on multiplying and it has a much more effect. These 17,000 volunteers who are helping, they’re also motivating others and it’s just growing. Question 5: How should I, the listener, begin to grow in hope or share hope today? Give me some simple steps. If I’m not a hopeful person listening to the podcast or the interview or I know someone who’s really struggling to have any hope in life, what are the basic starting steps that I should teach somebody to start growing in hope? I’ll share a very small story. All these kids that I have, they’re from the slums. They eat twice. They probably cannot eat three times a meal properly, some of the kids. They’ve lost all hope saying, what will happen if I actually get education? It’s along with I don’t know if I can do that or not. What I did is I took them to a cancer hospital where the kids have around six months to two years to live. When my kids saw them, they are smiling, but they have two years. My kids actually have life. They probably don’t have food right now, but they know that they’ll live on. That’s something that I did just to show whenever we are in the position, what happens is we start comparing and we think, oh I have one glass of water and has two glasses of water. We are never thinking of what “I” have. That’s why we lose hope. That’s a very big challenge that you need to look into yourself what you have –that’s one thing. Secondly, to be hopeful I think you need to find your passion in life. That can be social work, that can be becoming a billionaire, it’s no harm in that. If you want to become billionaire, you want to create hundreds of jobs and change people’s lives, that’s fine. The important part is to find your passion like I did. I wanted to be with young people. I wanted to motivate them to good work. I wanted to teach the children. This is very important, finding the passion in life. When you find the passion, you need to do a bit of research on how you can go and get your passion, how you can actually reach the place you want to be. You need to do the research, find out the steps. You will do mistakes, do not lose hope. Everytime you make a mistake, you know that you are one step closer to success. I think that’s a very small way to tell people to find hope in their life. I know it’s not very constructive. I’m not a very constructive speaker. Oh no, you nailed it man, you really did. So, getting perspective on where you stand and how much opportunity even though you think you might not have any, how much you really do have is a great first step. Number two, it’s really identifying your passion and what drives you forward so you can really connect all the action steps you have to take to that passion and stay fuelled up and ready to go and then three, go forth take some steps, fail, win, succeed, lose – it doesn’t matter. Just get in there, get messy, start the process. I mean how straightforward is that? Especially when you’re young, you think less and you can take the risk. When you’re 20, 25, you’re not going to do it when you’re 35 or 40. It’s hard to take that risk. When you’re young, if you’re listening to it, go out, do what you want to do. If people laugh…People laughed at me for two years. It took me two years to make them understand I can do something. Well, I’m not laughing. I’m amazed that’s for sure. Well, if people want to follow you and find out more of what you’re doing, how can we connect? Social media links, website, what do you have out there that we can find? In website it’s called www.jaago.com.bd and also in Facebook or Twitter you type JAAGO foundation or the best is just google JAAGO Foundation I promise we will be the first one you will find out. The JAAGO Foundation is very well connected in social media and also web because as a non-profit we cannot promote, but Facebook is free, Twitter is free so that’s where we live. You’re right. So, I’ve done it. I’ve typed in JAAGO Foundation on Google and you dominate like the first three pages of Google so I think you’ll get there. Your social media links is on there, it’s easy to find and I’ll make sure that we include all of those links on the show notes page at isharehope.com. If you look up isharehope.com/Korvi, you will find all things about this interview. So, man thanks so much for your time, your energy, your passion. You just feel it and it’s really, really encouraging. What do you do when you get a gift? Do you keep it in a safe place, you make sure that it’s in a nice place and it looks nice? This world is the best gift that God have given us and rather than blaming that it’s not my work, it’s not my part, it’s not my land, let’s work together to keep it clean, to keep it safe. It’s our duty. No one will come and take care of our world. It’s us, we have to do it together. So, that’s a small message that I always try to spread. That’s awesome. Thank you. Great way to wrap this up. Korvi, a privilege to talk to you. I hope you have a fantastic evening and I hope the elections go well over there. We look forward to sharing this story and looking forward to hearing from you again. Thank you and I am hopeful. First of all, you’re in Bangladesh and there’s tons of people everywhere. How do you identify the kids that want to go to school with the organization versus the ones that don’t get in. I mean you only have so many spaces, right? Very true. Initially, we didn’t get children because of my name, it’s not a very typical name. They thought I’m going to promote Christianity, I’m going to promote religion, but now after the quality of education, everyone wants to send their children. We have a criteria. Income level. Every person in the family, the income has to be less than 2000 taka, only then you can apply to become a part of the foundation because education is 100% free here. Not only education, but nutritious boost, hygiene products. Everything is basically free – what you need to go to school. That’s one and secondly we do some background check because a lot of people come here just to take those things. So, if you’re actually motivated to come and study, this would also depend on what we do with the children. Children, they just come to do the small criteria and there are thing that’s done by our volunteer and our employees to see if the information are correct. You’ve done so much with the foundation, you’re in front of crowds all the time, you’re speaking to a lot of people, what scares you today? You’re a really brave person, you’ve conquered the world now, what still makes you nervous? If I see a lot of crowd and I have talk especially if I have to give presentation and stuff with Power Point. If you ask me to talk, I could talk, but if you put me to a systematic process, I dysfunction. I think what scares me, honestly speaking it’s hard to say because I was always a risk taker, so if I thought something scared me I just took the risk and some of these young people, these awesome risk takers, somehow I have succeeded. When you’re not working 18 hours a day or having fun 18 hours a day since you love what you do for work, what do you do when you’re not working with the foundation? If you’re just going to go out and have a fun afternoon, what’s it going to be? That’s really hard to say. It’s really hard to say because honestly speaking, I don’t do that. But yes, for my hobby I do photography. That’s also part of my work. I always take pictures of whatever is going on. Photography is a small passion that I have. That’s great. Will you send me a few pictures of just maybe a sampling of your work because I would love to put a slideshow of that on the show notes page. Sure. Actually, we just had an exhibition so I put 8 pictures into story entitled 8 pictures is a story of a small child. His name is Jibana. Jibana means life, so this is an 8-slide picture story. I’ll send it over. If you want to listen to some awesome music to jam out with, what’s it going to be? Favorite song, favorite artist. I love upbeat music because I want to be cheerful. Yes there are sad times, the sad music, but something that I usually listen to when I need a bit of inspiration is something like Michael Jackson songs. Maybe it’s weird, but I do. …presentations that are made out of those songs, so They Don’t Really Care About Us is something that I started with. I always talk about a lot of people who care about a lot of people and that’s what I said to them. How about popular music in Bangladesh? What are you going to listen to? Oh yes, popular music in Bangladesh, for example there are fantastic music like Anusheh, she does really, really good singing, motivational singing and also folk which is also like a spiritual thing. I’m a big fan of Anusheh. Thanks man. I’ll tell you what, Korvi you’ve been a ton of fun to talk to. You really are. You’re super energetic. I wish everybody listening, you only hear the audio, at some point we may figure out how to use these videos that we get off the interviews, but you got to see this guy’s hair. It’s super awesome. I’m actually losing my hair which is why I’m doing voice work because you can’t see the balding head, but Korvi’s got the craziest, coolest set of hair.